Real Madrid hosted and defeated Athletic Bilbao by 3-1 at the Santiago Bernabéu this Sunday morning and extended their winning streak in La Liga to 3 games. 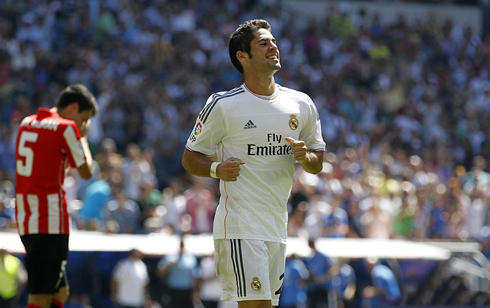 The home side goals came from the Spaniard Isco, who scored twice, and Cristiano Ronaldo. The Portuguese forward got to score his first goal of the season, after heading a cross from Angel Di María. The only thing worse than waking up early on a Sunday to see a football match, is to do it and still end up seeing your team losing. Fortunately for the Madridismo in Europe, that wasn't the case of what happened earlier this morning, as Real Madrid beat Athletic Bilbao by 3-1 at home. The Merengues were in control during most of the game and the double from Isco, as well as the first goal of the season from Cristiano Ronaldo, ended up occurring naturally. With the Spanish League about to be interrupted for nearly 2 weeks due to the FIFA World Cup qualifiers, Carlo Ancelotti is certainly very pleased to know that his team managed to go through this first stage of the season without dropping any points. This Sunday, Diego Lopez got to be once again the chosen man on Real Madrid's goal instead of Iker Casillas and by strictly judging the former Villarreal goalkeeper's performances so far, Ancelotti is yet to be given any reason to think about changing his number 1 at the back. The biggest surprise on Real Madrid's line-up ahead of this game didn't concern the defense though, but rather the team's midfield. Mesut Ozil was benched by Ancelotti and never had the chance to even step up to the pitch in any moment of the game. Could this has been a strong indication that Ozil might be close to leave the club during tomorrow's transfer deadline day? Without Mesut Ozil on the field, it was up to Khedira, Modric and Isco to set the tempo and the pace of the game in midfield, and they have done it brilliantly. Modric showed the usual quality in what comes to passing and reading the game, but this together with an impressive freshness to track back and help with defending tasks. Isco, the former Malaga FC star, certainly didn't want to stay on Modric's shadow this morning and has also performed at his very best level in the Bernabéu. The 21-year old scored two more goals for the club and became the team's top goalscorer in La Liga this season, as he has just reached the 3-goal mark. The opener would came off from an assist provided by Karim Benzema, when the Frenchman made a great lob pass into the back of Athletic Bilbao's defense that found Isco completely alone. The Spanish international midfielder brought the ball down with class by using the tip of his right foot and then finished it off from short distance, with a left-foot strike. Isco's dynamism and nose for goal are continuously making the difference in Real Madrid's first games this season and this ability to deliver goals on a regular basis can very well end up granting the Spaniard a spot in Carlo Ancelotti's ideal line-up for the rest of the campaign. Real Madrid would still add another goal to the scoreboard before half-time, thanks to a partnership that has already proven to be succesful in many occasions in the past. Angel Di María took a free-kick on the right and curled the ball right between to that "no man's land" zone, right between the goalkeeper and the defenders. Cristiano Ronaldo attacked the space as he so much likes to do and headed the ball into the back of the net, to make it 2-0 for Real Madrid. It was the first goal from the Portuguese star in this season's La Liga, as he still aspires to chase his personal record of 46 goals, obtained just two years ago (2011-12). The second half lost a bit of the rhythm that it had had in the first 45 minutes and Real Madrid only got to extend the lead when there were 15 minutes left on the clock for the referee to blow the final whistle. Very similarly to the first goal, the attacking play was once again built by the same two players: Karim Benzema and Isco. The French striker probably decided this Sunday was a good day to switch roles with his teammate and assisted Isco with another cross that would allow the youngster to beat Bilbao's goalkeeper Herrerín from a precise right-foot strike near the left post. The visitors still had time for their consolation prize shortly after, in an attacking play where they were keen to explore some sloppiness and lack of focus in Real Madrid's defense. The gameclock was marking 79 minutes when Susaeta ran down the right win before passing the ball backwards to Ibai. The Athletic Bilbao player then easily struck it past Diego López without any close opposition and in a position where he was only a few meters away from goal. Athletic Bilbao's reaction wouldn't go beyond that goal though and Real Madrid managed to preserve their 2-goal lead until the end. On a side matter, a few hours after the game finished in the Santiago Bernabéu, Real Madrid finally confirmed that they had signed Gareth Bale from Tottenham Hotspur, in a 91.5 million euros deal. However, the Welsh price tag didn't get to beat Cristiano Ronaldo's world record transfer fee from 2009, when the Portuguese switched Manchester United for Real Madrid, for 96 million euros. Nevertheless, the Merengues will now hold in their roster the two most expensive players in football history and as it is more than natural to happen, with that will also come a great amount of pressure for this team to win titles right away.